Are you ready for the two-tier internet? Committee members who regulate the domain names used on the Internet are about to meet in Australia amidst confusion and protest against their latest planned changes. A year ago ICANN (the Internet Corporation for Assigned Names and Numbers) announced it would be introducing “generic” domain names. Now, several surveys show that could be doomed to failure. The idea is that instead of having “.com” or “.co.uk” you could have any domain name ending in whatever way you liked. So, for instance, it would be possible for me to have “.jones” or “.psychologist”. Cities could have their own domain endings like “.london” or “.paris”. The possibilities are endless – well almost. You need a cool $185,000 to buy one of these domains – rather different to the few quid you pay now. ICANN itself is only expecting around 500 applications for the new “top level” domains. Clearly, the applicants are going to the big brands and the world’s largest corporations – already people are bandying around suggestions such as “.nike” or “.microsoft”. It all sounds wonderful – having a specific domain name based on your business name or on some other word associated with your company. For instance, if you run a marketing consultancy wouldn’t it be fab to have your domain “.marketing”? Well it might be. However, the ICANN proposals – and its pricing structure – clearly suggest the creation of a two-tier Internet. One for big companies and organisations that can afford it and one for the rest of us who don’t have a spare $185,000 in our pockets. 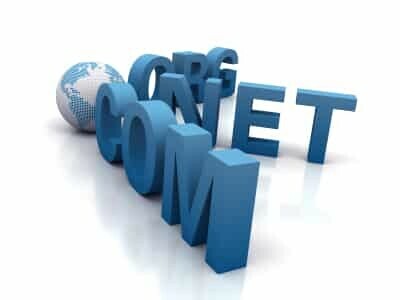 In order for the special domain names to work there will have to be technology changes at the heart of the Internet – as well as to browsers which currently default to the world’s most popular domain, “.com”. So, come the establishment of the new domains, browsers will have to work out whether you mean “.com” or whether you mean .”microsoft”. What the ICANN proposals fail to take into account is that many people “search” using the address box. They type in “microsoft” knowing the browser will correctly fill in the rest, such as the “http://” and the “.com”. For the future, Internet browsers will need to know whether you mean, say “marketing.com” or “.marketing”. It will inevitably mean a potential preference for the new top level domains, giving the big companies an advantage in being found. Furthermore, we’ve had over 15 years of “.com” being the “default”; we are used to it and live with it easily. Several surveys published this week (like this French survey) show that two-thirds of people will be confused by the variety of potential domain names. In addition, there are concerns about trade marks, cybersquatting and the increased potential for online crime. ICANN appears to be ignoring a basic psychological principle that people need familiarity. What they are proposing is similar to the Government saying they are abandoning the usual road sign scheme – triangle for warning, circle for instruction – to allow anyone to construct any signs in any colours and any shapes. We’d soon get lost and the roads would be in chaos. The “.com”, “.net” and “.org” system may be boring – but it works. Tinkering with it in the way ICANN is about to introduce is a retrograde step that will inevitably lead to persistent confusion amongst users and a two-tier web in which the rich get the most rewards. But no matter how much we protest, it is going to happen. So, if you run an online business that can’t afford to buy the $185,000 domain name you would really like, you need to take some steps to protect your future income online. Firstly, make sure you already own as many combinations of domain names as you can get – the “.com”, “.net”, “.org”, “.co.uk”, etc. If you need a place to get cheap domain names from, I recommend using Heart Internet in the UK or GoDaddy in the USA. Secondly, get the relevant names for your business on services like Twitter and from this Saturday also on Facebook. Reserve your business names and trading words on all sorts of services, like MySpace or FriendFeed and in social networks – even if you don’t use them yet. Getting them will help you protect yourself in the future as it firstly prevents other people, such as competitors or “squatters”, from using them and secondly it gives you the opportunity to market your business better. You simply can’t afford to wait on this; the domain name changes that are being finalised this month in Australia will impact on your business. We all need to take steps now to prepare ourselves so we minimise the impact on our business of the inevitable two-tier Internet.